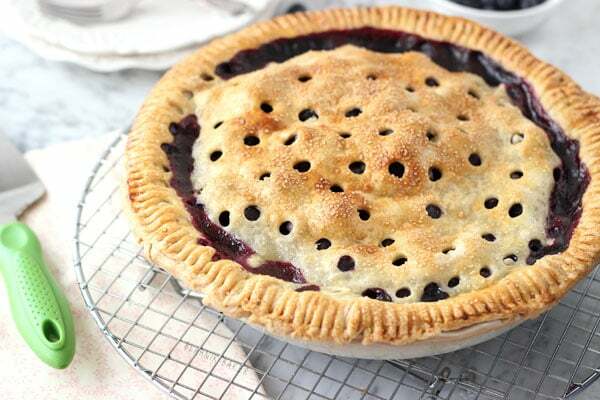 A classic blueberry pie recipe with a buttery flaky crust, fresh blueberries and lemon juice. It’s Summer perfect! You asked and I listened friends. 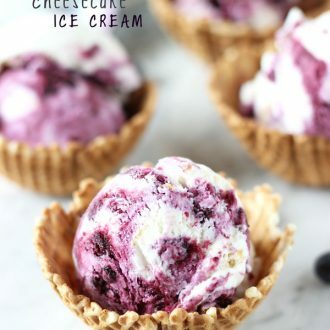 Yesterday I asked on Facebook what you would like to see today; blueberry cheesecake ice cream or blueberry pie. The answer was overwhelming pie so I am super excited to share with you this honest- to-goodness down-to-earth easy-to-love blueberry pie! Seriously! It doesn’t get easier and summer does not get better if you ask me. 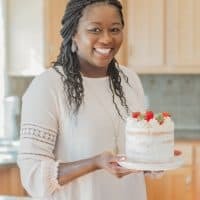 I love me a good pie and there is just something special about a good piece of pie that makes moments shared with loved ones even more memorable. And this pie did that for me last weekend. It all started with blueberry sauce I made from a huge haul of blueberries and just looking at the pretty pink sauce made me crave a good pie. So I used the rest of my berries and got down to some good ole pie making that Sunday. 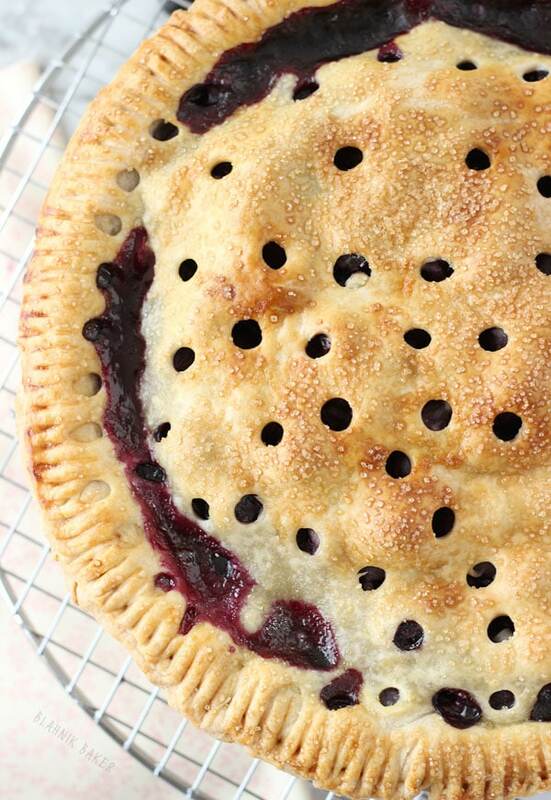 This blueberry pie starts with a simple but trust-worthy pie crust. Butter, flour, salt and ice cold water is all you need for a buttery flaky pie crust. 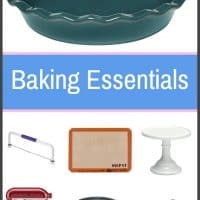 Pie making takes time and it’s for a good reason. Pie crust needs to chill to get that buttery goodness we all love. So let that crust chill for at least an hour. Remember this is a lazy Sunday affair. The crust is then rolled out and filled with a bounty of blueberries. Fresh blueberries are macerated in sugar, fresh lemon zest and juice, a hint of almond extract, and some flour to soak up the juices. Toss all together and pile high into your crust. Pile it high…no kidding!! Then just bake until crust is golden brown and your juices are bubbling. In the meantime, relax and enjoy the aroma in your house! Once pie is baked, be patient dear friend and let it cool. Do not rush the process, I know it’s hard but let it rest so those juices thicken. Then slice and enjoy a piece outside in the garden, backyard or porch like we did. 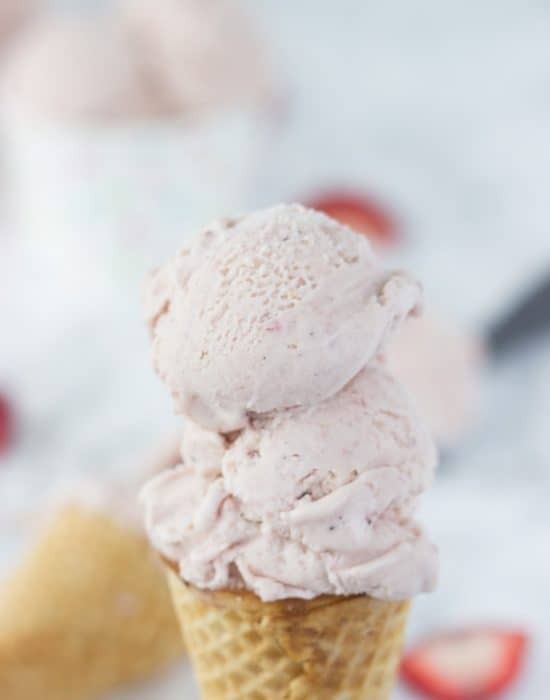 Don’t forget to enjoy with a scoop of ice cream (uber important for a hot summer day!). Now tell me summer isn’t a wonderful time of the year. I don’t know about you, but I’m gonna be soaking up all I can of this summer before Upstate NY hits me in the face with it’s winter soon. I suggest you do too and make this honest to goodness blueberry pie this weekend! Prepare ½ cup ice-cold water and keep in fridge. In a food processor, pulse flour, sugar and salt. Add in half of the butter and pulse for 30 seconds. Add in the rest of butter and pulse until the mixture looks like coarse meal. Sprinkle about 6 tablespoons cold water over mixture and pulse until dough comes together in clumps. If dry, add a little bit more water (1 teaspoon at a time) until dough comes together. Remove dough from processor and pat into a disk. Divide dough into two disks; one slightly bigger than the other and wrap in plastic wrap. Chill for at least an hour or overnight. The dough can be made up to 3 days ahead. Keep chilled. Let stand at room temperature a few minutes before rolling out. Meanwhile, in a medium bowl, toss the blueberries, extracts, zest and lemon juice. 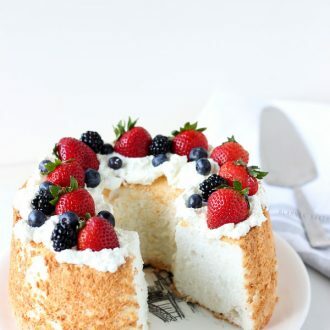 Toss in sugar and flour and make sure berries are coated with flour. Let sit at least 20 minutes. 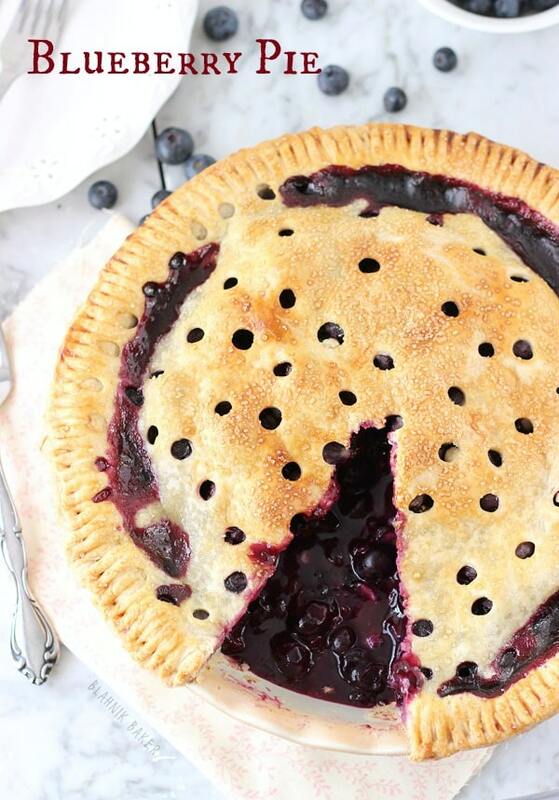 Fill the pie crust with the blueberries. Pile it high in the center. Roll out the second dough and top the pie. Decorate as you desire. I used a round tip to cup out holes of the rolled out dough (before topping the pie). You could also cut into strips to create a lattice top. Crimp the edges. Let pie cool for at least an hour before serving. Yay for pie! We are Friday pie twins today. 😛 Blueberry is one of my favorite fruit pie flavors and yours looks absolutely fabulous! Juicy in all the right ways. Wow ~ this is quite a stunner!!!! I hope I score some delicious blueberries this weekend – might have to give this one a try! Yes!! I hope you get some blueberries!! This pie looks perfect, so juicy and delicious! Happy Friday! 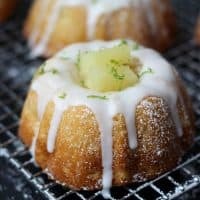 Looks wonderful, and I’m so glad you added the lemon peel! I usually add that to my blueberry pie too. I’ll be making this soon, no doubt. Trisha thank you! I knew you were excited about the pie 🙂 Thanks for stopping by! And I hope you have a great weekend! Wow! That is one ahmazing pie, my friend! There’s something about blueberry pie and summer . . just makes sense. I see why this one won! I love what you did with the top crust here. . so pretty!!! love this, Zainab! 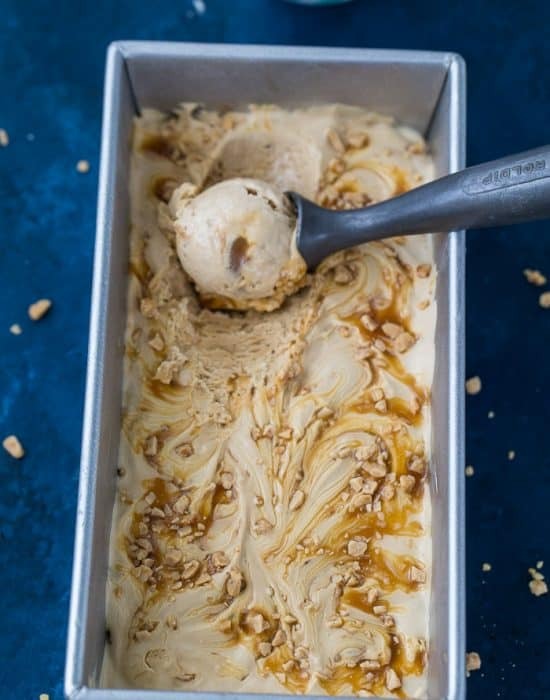 Yes I will have to make this this weekend. My daughter LOVES blueberries and would be so happy to enjoy this pie. Beautiful pie, and I would’ve chosen blueberry pie over ice cream too! I’d love a big slice! Hello beautiful Cate!! 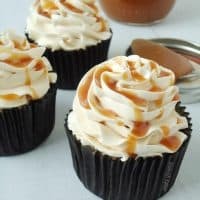 Would definitely love to share this with you! FYI: I am coming to your city next month. Will text you details! I know it really was like a bakery 🙂 Thanks Samina! Blueberry has to be my hands down favorite pie. Yours is seriously gorgeous! 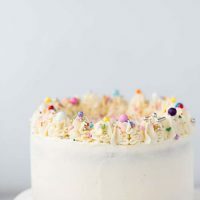 I love the polka-dot cutouts on top – for some reason it feels so summery to me! Me too! Saw a pie from FNM and knew I had to try it lol! I am in looooove! 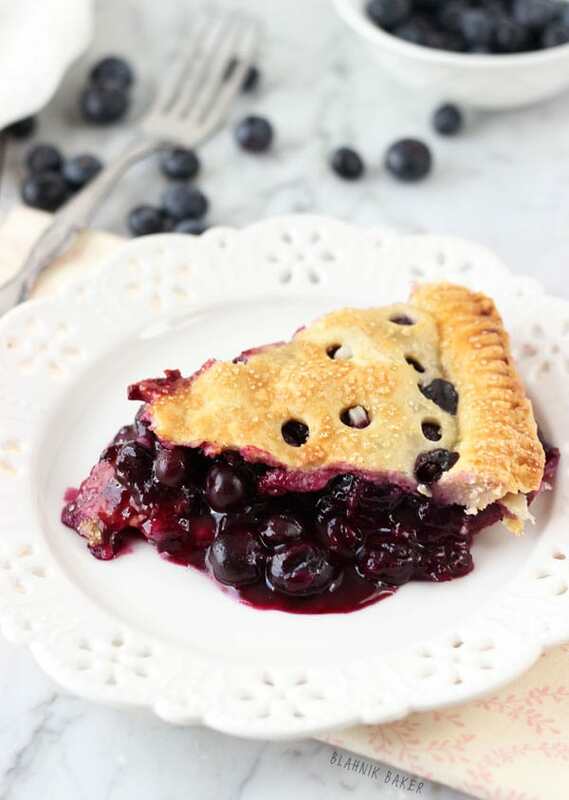 There’s something so classic and delicious about a good old fashioned blueberry pie! Omg I love that you are on a blueberry kick. 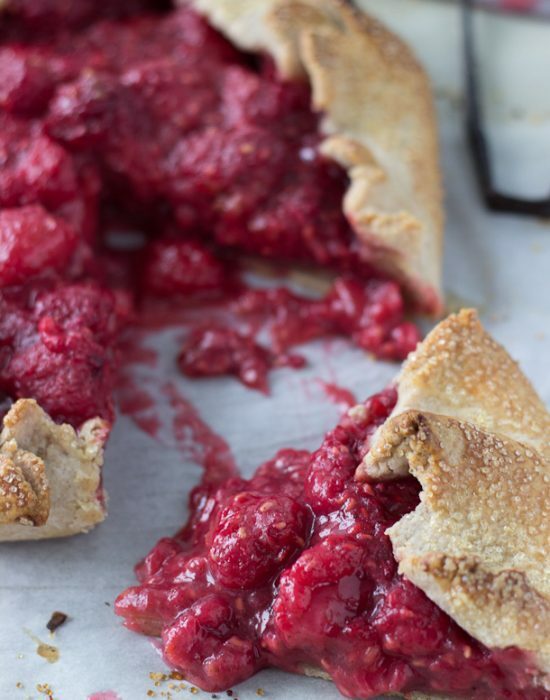 Bring on the summer recipes–I love me an awesome pie like this one!! The kick has been amazing!!! 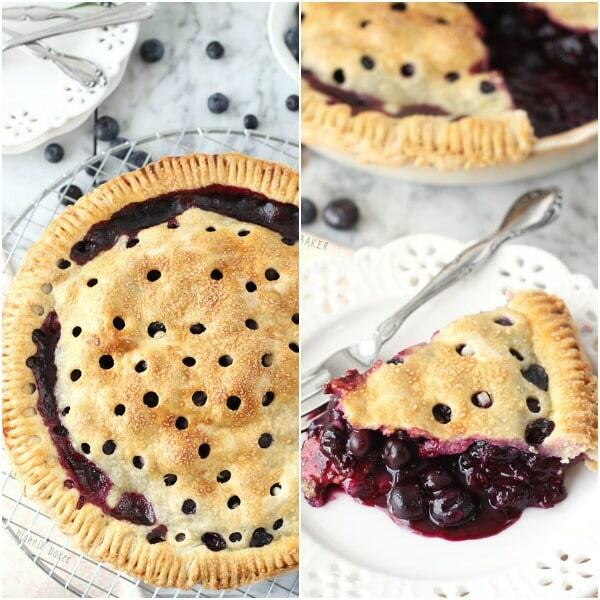 Blueberry pie.. classic pie andit looks so gorgeous! Beautiful! I love how you cut circles in the top. I’ve been meaning to make blueberry pie too with the several pounds I picked but haven’t gotten around to it. This pie is gorgeous! I love how many classic desert you include. They’re so timeless! 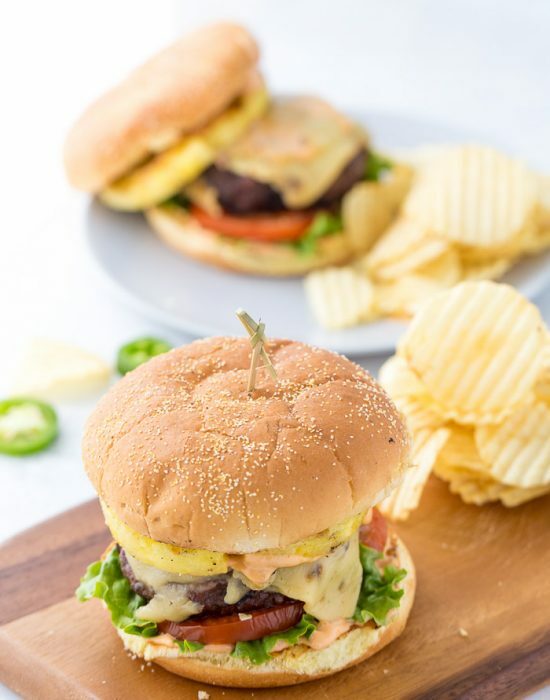 Thanks for the recipe – have a great weekend. Thanks Vickie! I hope you have a great week! I need this pie now! Blueberry pie is the bomb and that glossy filling is spectacular! Waiting for pie to cool is the worst, but it’s so necessary. It really is the bomb!! That is one gorgeous blueberry pie!! It looks so delicious. Blueberries are one of my favorites…we have a blueberry bush but the birds keep beating me to the berries! For quite some time now, blueberries and I have been best buddies, so this pie is definitely right up my street! 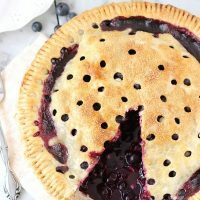 I love how the blueberries all bubble out a bit onto the crust – just makes it seem super delicious! Love this. Straight up blueberry pie is so classically delicious. Yes both together will probably be amazing!!! Thanks Graham! PS: Happy belated birthday!! I’m officially craving pie now! This looks awesome! This looks absolutely gorgeous! I’ve got to try this before summer ends and it’s super pricey to get fresh blueberries. Plus if I make it while I’m at college that means my roommate and I are going to have to eat the whole thing and as much as I love pie, my jeans don’t haha. Now I see why everyone chose the blueberry pie. It looks amazing!!! Right?? It’s just hard to pass by!! This is my kind of pie! 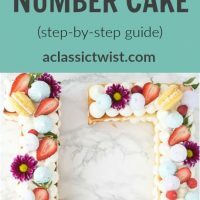 Basic crust, very berry filling, a fun design on top – love it! I would love to bring this over and enjoy a slice or two with you 🙂 Thank you Nancy!! Pinned this sweet amazingness! Wow does this look so good! Saying hello from what’s cooking Wednesday! Zainab, this pie is really impressive. I love the golden crust and the goey sweet blueberry filling. I absolutely have to make it before summer is over! Wow! That is one gorgeous looking pie! I love, love, love blueberry pie, and I definitely have to try this. And, I love the cute dots in the crust! I’m definitely trying that too. Pinned!